Thirty-eight years old, she lives on the twenty-five-acre Hope Farm in Buckinghamshire, surrounded by (mostly) four-legged friends and rolling hills. There’s Anthony the anti-social sheep, Tina Turner the alpaca with an attitude, and the definitely-not-miniature pig, Teacup. Feel-good, funny and an absolute must-read from the queen of romance Carole Matthews, Molly’s story will make your heart sing. 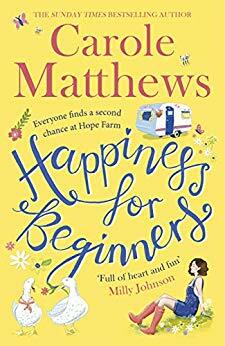 New beginnings and second chances abound in ‘Happiness for Beginners’. You can pre-order Happiness for Beginners from Amazon and will be available to buy from good bookshops from 21st February 2019.